Cry Havoc’s charity donation for 2015. Hello! We’re Cry Havoc, a Cotswold Morris dance side based in Botley, Oxford. We’re a mixed side – mixed genders, ages, backgrounds, abilities. We still have a notable base of members who live in Botley, but others come from other parts of Oxford and surrounding towns and villages. We dance for fun, but we also raise money for a local charity each year. Over the years, we raised just under £20,000 for the causes we’ve chosen to support. In 2018, we raised £1050 for Oxford’s Silver Star Unit, the service at the John Radcliffe Hospital that provides special care for mothers with medical complications during pregnancy. In 2019, we’ll be collecting for Botley Bridges, which provides services for families with younger children in our local area. Use the links above to find out more about us, access our blog & calendar of events, investigate Jim’s excellent collection of tunes favoured by Cry Havoc musicians, or even book us for your event. Cotswold Morris?is?the traditional folk dance of the Oxfordshire/Gloucestershire area. Our repertoire includes dances from Bampton, Adderbury, Bledington, Fieldtown (aka Leafield), Headington, Brackley and Lichfield. We also have two dances in the new Botley tradition. We’re always looking to welcome new dancers and musicians, so if you think you’d like to try out the Morris, come along and say hello over the summer, or come to one of our Thursday night practice sessions. In October we run some special taster sessions, but if you missed them, don’t worry, come along anyway. 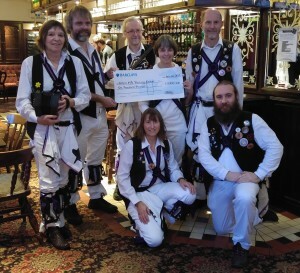 We were founded in 1993, after someone had the bright idea of including a bit of morris dancing in a pantomime. This generated enough local interest for Paul Ferret, formerly of Towersey Morris, to set about teaching the side on a regular basis. Paul has since moved away from Oxford, but his then pet buzzard, Havoc, is immortalised in our name and emblem.